The strong winter storm has already produced enough snow to close schools and force drivers to use chains on a main route through San Diego's mountains. A warning was issued at 1 p.m. Friday advising Lindbergh Field of possible lightning. A thunderstorm with cloud to ground lightning will move over or be within 5 miles of the airport from now until 2 p.m.
A chance for thunderstorms will be possible through the evening for Lindbergh Field. Shortly after noon, a Jet Blue flight was struck by lightning 15 miles outside the airport area. The plane landed safely and all 147 people aboard were uninjured. "We saw a bright flash outside and we wondering. Was that lightning?" said Heather Fellmeth of the Marist College water polo team. A winter storm brought snow to local mountains Friday. She said there was no change in the planes flight but they did hear a pop that accompanied the bright flash around noon. Fellmeth said the flight crew later told the passengers that they were struck by lightning. The captain of the plane told authorities the bolt struck the nose of the plane and exited the tail. Crews are checking the plane to ensure that all systems on the plane are working properly. Roadway flooding was seen on Quarry Road between Lemon Grove and La Mesa. Officials shut down the road to all vehicles until the water clears. It will be cold, wet and windy at times Friday. 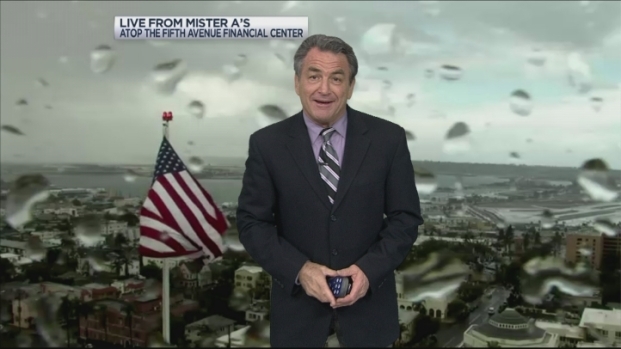 San Diegans should expect rain showers on and off throughout the day. As of 10 a.m., rainfall was meager across the county with a trace of precipitation recorded at Lindbergh Field. Hail fell in areas like Carlsbad and Mira Mesa. 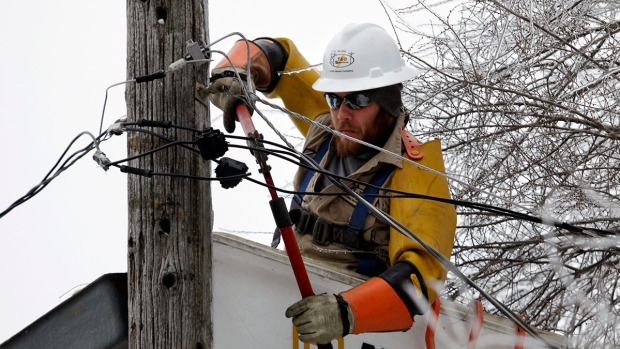 The same powerful band of storm activity produced thunderstorms and lightning some communities. 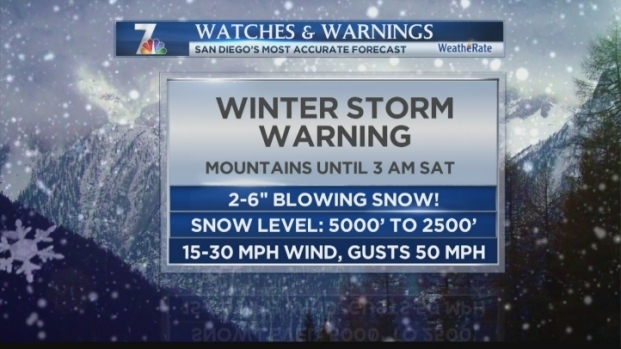 The winter storm warning was in effect for San Diego’s mountains through 3 a.m. Saturday and called for the potential for one to four inches of snow in areas like Mount Laguna and Palomar Mountain. Gusts of winds have been recorded at up to 30 mph in mountain regions according to NBC 7's Whitney Southwick. The Mountain Empire Unified School District east of San Diego closed schools Friday because of the snow and hail forecasted for the area. Visibility for drivers on local roads could drop to below a quarter mile at times in the snow with blowing snow possibly and fog according to the National Weather Service. For some parts of the local mountains that could mean black ice or slippery roads. Also, before you head to the mountains check with Caltrans Road Conditions on chain requirements. By 9:30 a.m. Friday, chains were required on Sunrise Highway according to the California Highway Patrol. There was also a coastal flood advisory in effect for parts of San Diego County through 10 a.m. Saturday. Among the areas that may be affected were Cardiff, Del Mar, La Jolla and Imperial Beach according to the NWS. While snow and rain will taper off late Friday night and into Saturday morning, San Diegans can expect cooler than normal temperatures.